Matt Pope and Stephen Dixon battle against Dundee Stars. Cardiff Devils suffered a shocking Elite League defeat against Dundee Stars in Scotland. Devils had swept to nine successive wins in Scotland this season, beating Dundee, Glasgow and Fife in league and cup fixtures. Cardiff have scored 41 goals and conceded 20 in 10 matches against Scottish teams. But they crashed against a Dundee team intent on keeping their play-off hopes alive. A well-taken Jordan Cownie goal after a good pass from Johan Andersson gave Dundee the lead at 8-56. 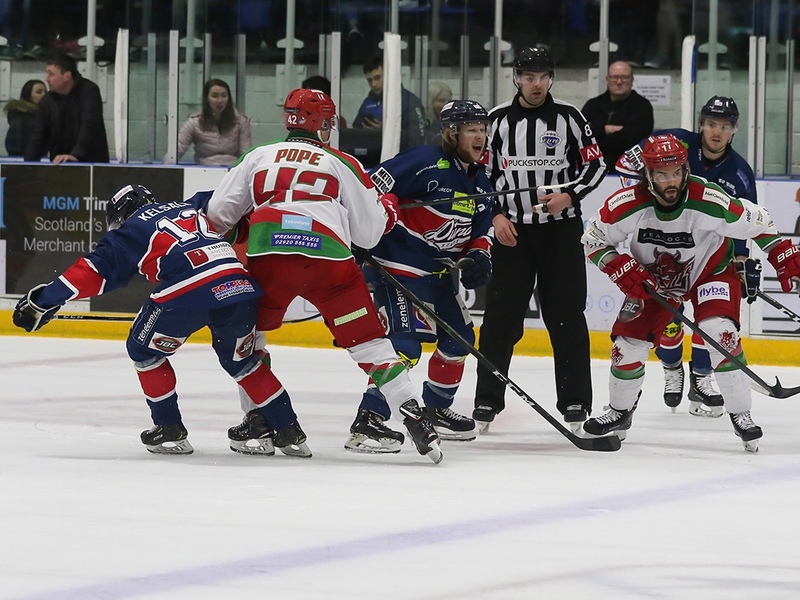 Action: Dundee Stars v Cardiff Devils Pic: Derek Black. Brian Hart doubled Dundee’s lead. The puck hit the pipes and play continued for some minutes before a whistle and the referees were able to go back and check the video. A goal was given after the review, with the puck seemingly having gone through the netting. Cardiff halved the arrears with 4-26 left in the middle period as Mark Richardson struck on the powerplay. Pontus Sjögren came up with some big saves in the third to keep the Stars ahead and the home side added an insurance goal in bizarre circumstances. Goalie Ben Bowns went behind his net to play a puck, but it took an odd bounce off the boards straight to Lukas Lundvald who was left with the simple task of coming in front and slotting into the empty net. Devils goaltender leaps to ssve. Pic: Derek Black. The win keeps Dundee still in with a chance of a play-off place, although they’d need to win both of their remaining games and hope other results go their way. Cardiff are four points ahead of Belfast at the top, having played a game more. Belfast kept the Elite League title race alive by winning against Sheffield. Belfast took the lead at the SSE Arena arguably against the run of play, an inch-perfect pass from Kyle Baun allowing Patrick Dwyer to deflect the puck past Jackson Whistle at 12-41. Giants extended their lead in period two when a diving Jordan Smotherman poked the puck past Whistle to make it 2-0 at 24-16 before Blair Riley’s wrist shot glove side made it three with 43 seconds left in the period. Baun put the Giants four ahead easy in the third and Colin Shields made it five after 49-52. Sheffield pulled a goal back at 51:25 shorthanded, Ryan Martinelli fired past Andrew Dickson, who had not long taken over in the Giants’ net with what would be the final goal of the game. Belfast stay alive in the title race, but will need to win in Coventry midweek to keep the race going.